You are looking for a spot for a meeting in your office. You want privacy. Or you want a video connection to a regional office. Or maybe you just want a place where your team can ignite inspired ideas. You look around and suddenly realize that your open office is missing some important elements; a dedicated meeting room, with a door and maybe a bit of quiet. Systems Furniture says modular conference room systems add back the meeting space you need in your current floorplan. 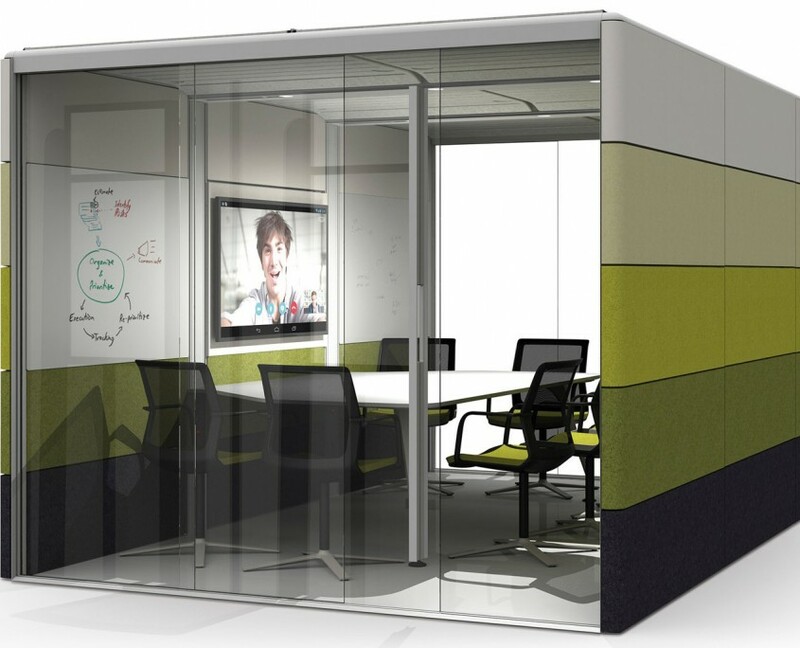 The Air3 pod from Orangebox is a modular meeting room that is easily installed within an existing floorplan. Its patented opening and closing roof system adds acoustical privacy but doesn't interfere with office sprinkler systems. Because it is modular you can make changes to the panel configuration or move it to a new space entirely. Knoll's Rockwell Unscripted Creative Wall is one of the most versatile freestanding conference room systems. When the issue is not acoustical privacy, but how to jump-start group creativity, Creative Wall's components build the room that you need. Modular panel walls and mesh doorways, called pivot fins, are secured to Creative Wall's overhead beam for stability. Inside the room you can choose between moveable whiteboards, tackboards, magnetic porcelain, or corkboard to facilitate the collaborative process. Wheel in Knoll's hospitality cart full of snack supplies and let the brainstorm begin. Slate, manufactured by OFS, creates the perfect setup for audio-visual equipment and remote group conferencing. The combination of a freestanding divider wall, meeting room work surface, media support and storage elements gives you a dedicated video conferencing area. Rich wood finishes complement your work environment. Conference room systems are just part of the commercial office design expertise at Systems Furniture in De Pere. Our interior designers and account managers travel throughout northern Wisconsin including Sheboygan, Appleton, Oshkosh, Green Bay, Wausau and Eau Claire with ideas for seating, collaboration furniture and desking. For more information contact us at 920-336-1510 and be sure to review our projects at sysfurniture.com. View the original article on Conference room systems here.